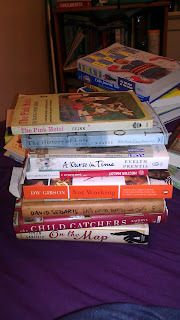 I was going to start this post with how choosing a stack is too much hard work but really I just chose a pile of books that I am somewhat likely to get to tomorrow and called it a day. But I decided to take a really bad cell phone picture. Yes I have purple sheets They are jersey and super nice to sleep on. You can't read any of the titles so I will link them. Simon Garfield - On the Map: A Mind Expanding Exploration of the Way the World Words- this is a book I bought on a whim when I had a coupon. It looks interesting but I doubt I will finish it. Kathryn Joyce - The Child Catchers: Rescue, Trafficking and the New Gospel of Adoption - I am fascinated by international adoption and even though this is heavy non-fiction I might read it. E.L. Konigsburg - The View from Saturday - I was so sad that she died and I am about 90% sure I never read this one. Evelyn Prentis - A Nurse in Time - I have a "Call the Midwife Problem" and I bought this book after I read all the books. I don't know why I haven't read it but I am super-excited to start. Victor Hugo - Le Dernier Jour d'un Condamné - More French. I have been reading "Les Miserables" for years but I believe that the read-a-thon is a happy time and reading Les Mis would make me sad. So I chose this instead. Nicole Krauss - The History of Love- A novel. For adults. I don't read many novels and the last one I read sucked. 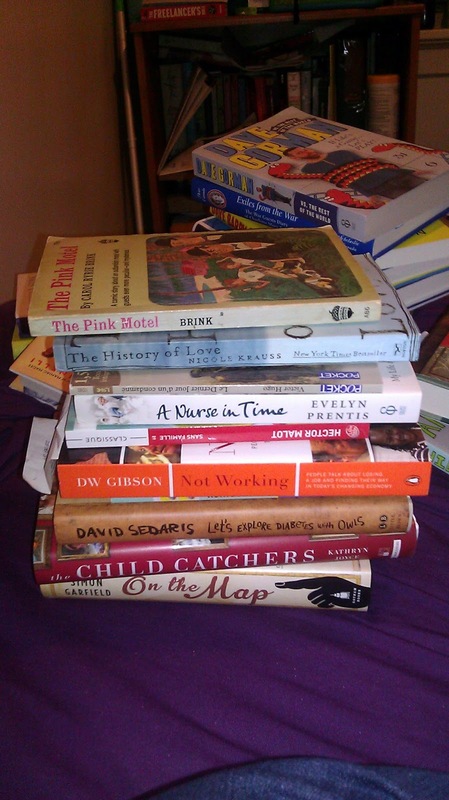 There are a couple of books I might substitute in. I have Prodigy by Marie Lu but it is the second book in a series so I am terrified it will end in a cliffhanger and then I will be all mad. I also have This is What Happy Looks Like by Jennifer E Smith. That one looks cute and fluffy. I also have some e-books for review from Netgalley. But I am not currently in an e-reader mood. I go through phases and right now it is a paper mood.A Also moving the Kindle and the Nook is going to be a lot easier than moving the pile of books. That's a nice varied selection of books! Good luck with the read-a-thon today.